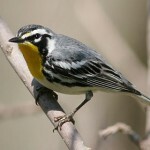 Description: Short tail; yellow rump; thin, slightly downcurved bill. 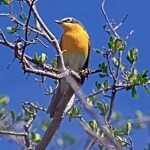 Most plumages have yellow on face, with the color usually extending to sides of neck. Breeding male has chestnut ear patch; bold black streaking on underparts; blackish crown; and white wing patch. 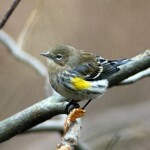 Female is slightly duller, with two narrow white wing bars; lacks chestnut ear patch and white wing patch. Immatures are even duller. Habitat: Occur in a variety of habitats, ranging from coniferous or deciduous forests to parks and suburban gardens. 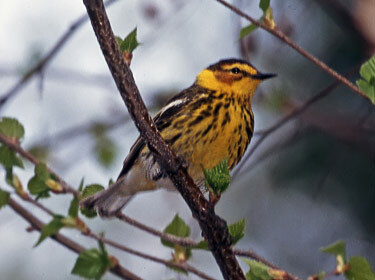 Where in Nebraska: Rare casual spring migrant in eastern Nebraska. Field Notes: Majority of migration takes place east of the Missouri River. Winters chiefly in the West Indies. Most often found in conifers in cemeteries.